Energy Minister Jeff Radebe, centre, speaks on why South Africans have to pay higher fuel prices. 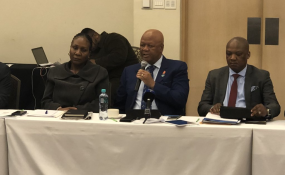 Cape Town — Energy Minister Jeff Radebe has presented several reasons why South Africans have to pay more at the pumps during an Energy Portfolio Committee meeting. The session comes a week after it was scheduled to be held, the delay blamed on "miscommunication" by an official who faces disciplinary action for creating an impression the department boycotted the event. Minister Radebe said that fuel prices have reached their highest level, adding that this concerned government because high fuel prices affect the disposable income of households and stresses the economy. Minister Radebe outlined several causes responsible for higher petrol prices. These include a 2016 decision by the Organization for Petroleum Exporting Countries (OPEC) and key non-OPEC countries to cut 2% of the global oil production to support higher oil prices. Consequently, oil prices doubled, Radebe said. Geopolitical stability was also cited as a key cause behind the prices hikes. "Other less spoken about reasons for the rise in fuel prices is political instability," said Radebe. "Political turmoil in Venezuela has led to a near collapse of oil production, Venezuela is under U.S. Financial sanctions and is also a key OPEC member." Radebe added: "Regime change in Libya in 2011 has led to production challenges. Libya went form producing 1.5 million barrels a day before the change in government, to 600 000 after. The recovery in the global economy has meant that there's an increase in the demand of oil. Our policy as government is to apply a cost-recovery principle. Regulate petrol prices at retail level and for refineries to be cost efficient." Fluctuation in exchange rates have also played a role: "South Africa is a importer of refined diesel and petrol. Prices are based on International Benchmark prices at key refining centers, prices are subject to currency fluctuation as oil prices are quoted in USD per barrel," Radebe said. Energy Deputy Director-General Tseliso Maqubela added that until oil is discovered in South Africa, importing oil and fuel is the reality citizens will have to live with. Maqubela also said warned that fuel companies setting their own fuel prices free of regulation would result in the loss of 55000 filling station jobs. Deputy Minister of Energy Thembi Majola elaborated on political stability and noted differences in oil and refineries as additional factors that require consideration. "A question was asked why aren't we importing more from Angola and Nigeria; much of the companies are private and the types of oils are not the same, which speaks to investment of different refineries. An example is the case of Iran. When sanctions were reinstated it meant companies that had invested in new refineries, meant to refine Iranian oil, were banned from doing so because of sanctions; they were working at a loss. So political stability is also important."